Calvary Church celebrated our Centennial in 2017. As part of that celebration, we began a Capital Campaign to help strengthen our endowment and ensure Calvary’s ongoing mission work in the future. Here you can download our official pamphlet! What will the Capital Campaign accomplish? 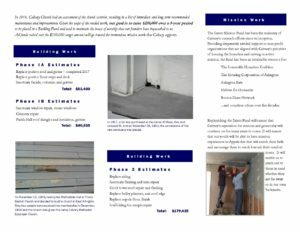 The campaign will support essential building work, in two phases (see brochure). Phase 1 includes work on the portico (exterior front entrance with columns), sanctuary, chimneys, and parish hall. Phase 2 includes work on siding, the historical clock tower and belfry, and steeple. How much will the Capital Campaign raise? Our goal is $250,000 in total. What if we raise more money than the goal? Any support above the goal amount will support mission work at Calvary. This money will go into a fund dedicated to mission work in our community and around the world (the Saints’ Fund). Does the work really need to be done now? Yes, some of the work is safety related and some will only get more expensive with time. The rest of the work represents our generation’s part of maintaining the building so that it can bless the work and worship of future generations of Calvary Church. The Capital Campaign will allow us to proceed in a cautious and planned manner without taking unnecessary financial or safety risks. Who decides how to use the money? The Church Council, with the advice of the Board of Trustees, is responsible for deciding how to use the financial assets of Calvary Church. Very often (and this is our case), the Council will act on the recommendations of the Trustees in matters concerning the budget and upkeep of the church buildings and grounds. When will the work supported by the Capital Campaign be conducted? The Church Council and the Board of Trustees already have determined that the capital expenditures described in this campaign are so essential that they must be conducted beginning in the next three years. Some of the work is already being contracted. Yet, the total amount of the capital expenses exceeds what the church can afford through its annual contributions. In the absence of a Capital Campaign, the church would necessarily make the expenditures by partly spending down our endowment. This point is sufficiently important that we expand on it in special section of this FAQ [see below]. You will be offered a pledge card with several options: (a) all at once, (b) over 5 years, and (c) other timing that you propose. For those who pledge over 5 years, the church office will send a reminder each year. Payments may be by check to “Calvary Church” with a memo line that says “Calvary Church Centennial Campaign” or just “CCCC.” We will be happy to accommodate other payment methods or schedules. If needed, contact the church office to discuss. How should I decide how much to give? We trust your own reflection and prayer for this decision. In case it helps to have a benchmark, here is some more information about the campaign goals. Over 5 years, the Capital Campaign needs to raise for capital expenses approximately 1.5 times the amount that we usually raise for regular church expenses in a single year. Our suggesting giving amount is related in this way to the amount that you have pledged in the past for your annual giving. Is this suggested amount in addition to my usual annual giving? Yes, please. This Capital Campaign is in addition to our usual annual giving. What is the endowment of Calvary Church? An endowment is like a long-term savings account for a church. 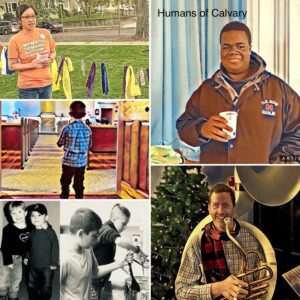 Because of generous gifts by members in the past, Calvary Church has two types of endowments: (1) larger restricted endowments dedicated to particular purposes (such as the Lucas fund, dedicated to helping low-income working families) and (2) smaller unrestricted endowments, which sometimes pay for large expenses that cannot be covered by pledges and giving (like the addition of the elevator several years ago or the upcoming repairs to the steeple and siding). Where does the money from the endowment come from? Money for the endowment can come from many sources but often it comes from bequests (money left to the church by someone in their will). Money can also come from parishioners as part of a Capital Campaign – like this one. In our case, we benefited greatly from two large bequests that arrived in the late 1990s and early 2000s. How much money is in our endowment? The amount in the endowment can change based on how much is given, how much is spent, and whether there are investment returns. The Calvary endowment has fluctuated from well over $1 million to less than $900,000. Our endowment is a source of security and opportunity for the life of our church. What good comes from having an endowment? The endowments have served Calvary Church well in two ways: (a) they help to support our mission work, seeking to be God’s hands and feet in our community and the larger world, and (b) they allow for steadier long-term financial planning even when annual giving and expenses both fluctuate. Why is a Capital Campaign helpful even for a church that has an endowment? The Capital Campaign will pay for most, but not all, of the anticipated new capital expenses. The money required for the needed work on our building is in excess of the Capital Campaign goal. The Trustees have already used some endowment funds to start the most critical projects. The campaign will partially replenish that money. The Church Council and the Trustees do not want to spend down the unrestricted endowment by the full amount of the capital expenses, because we seek to maintain the usefulness of the endowment for the church in the future as in the past. The planned endowment spending and the planned Capital Campaign will each do their part to meet the needs of maintaining our building so that it can support the good work of the church into the future. Should I make a bequest instead? Bequests are an important type of gifts to the church. The church today enjoys a strong financial situation in part due to bequests that past generations have made. Please ask the church office to contact you if you would like to discuss a bequest to Calvary Church. For this Capital Campaign, the schedule is in the next 5 years, too soon to be suitable for a bequest. Giving to the Capital Campaign today and in the next 5 years is an excellent way to support the church into the future AND to see the results of your giving while you are still alive to enjoy them.